What is Workforce Optimization Software? 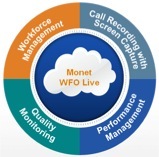 Workforce Optimization (WFO) software is not just one solution to call center service challenges – it is a full suite of automated services that can help a call center achieve its business goals and compliance requirements. Forecasting, scheduling, intra-day management and exception planning are all part of workforce management. Make sure the software allows for real-time adherence, so adjustments can be made quickly before they can impact service levels. A call recording solution is invaluable in agent training, coaching and troubleshooting and establishing best practices. It also helps to resolve transaction disputes and determine regulatory compliance. You’ll want to invest in a solution that archives and retrieves calls quickly for review. The quality management process incorporates dashboards, scorecards, agent analytics, customized reports and key performance indicators, to improve service levels, optimize utilization of resources and enhance cost management. Screen capture adds video to the voice recording of an agent’s interactions, providing a visual record of how agents employ the technology at their disposal. This aids in agent training, and can help call center staff improve their performance in such key areas as first-call resolution. By analyzing the scorecards and reports produced by workforce optimization software, call centers can become more proactive in their quest for improving customer service, rather than reacting to events that have already occurred. Watch this video to see how a unified workforce optimization solution can help your call center improve performance by breaking down organizational silos and making it easier to share data across functions in your center.